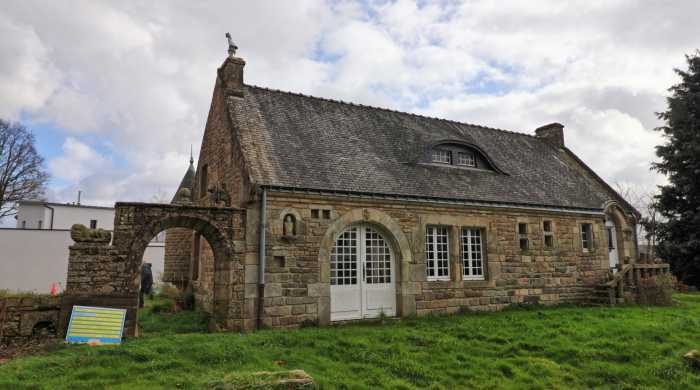 Just off the centre of the lively town of Locminé is this very unusual home, it was built in 1967 using a whole load of reclaimed stone and sculptures, the property is liveable as it is, but is best to consider it as a renovation project. On the ground floor you have a massive split-level living room with a simple kitchen to one end, two nice fireplaces and not forgetting the little tower to one end. Then there is a corridor, a small bedroom, a shower room, toilet and laundry room, as well as a study. On the top floor you have a bedroom and enough loft space to make at least 3 bedrooms. The property sits on just under ¼ of an acre with carport.